Joe Hughes is the Director of Real Estate Operations for Navigate Homes. He leads the process of when and where to build speculative homes, works with clients on custom homes and oversees all real estate deals. Joe attended Wartburg College where he received degrees in Communications and Leadership and competed on the track and cross country teams. 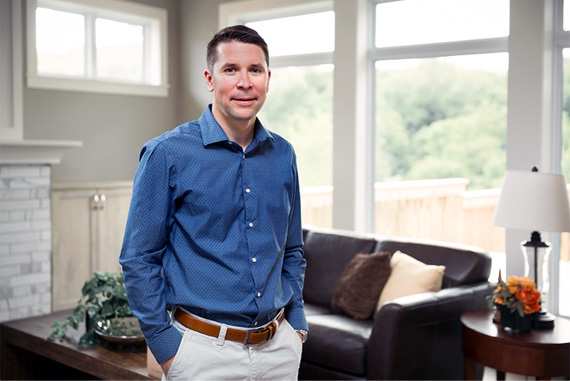 After spending eight years in Boulder, Colorado as a real estate broker, Joe and his wife Vanessa decided to move back to their Iowa roots in order to raise their children. Joe is involved with Young Life Committee, the Iowa City Noon Rotary Club, and the Chamber of Commerce. He enjoys watching the Denver Broncos on Sundays, and loves to be outside running, mountain biking and playing with his kids in the yard or one of the local parks. Joe is licensed to sell real estate in Iowa. Joe advises anyone who is looking to build a home to be open and honest with your building team about what you want. If you share your vision, the team will be better prepared to deliver your dream home. Favorite Iowa Fact: Iowa is NOT flat — anyone who has ridden RAGBRAI knows this. Favorite room in the home: The yard — I love being outdoors!